Sometimes I like to tuck a mini card into a lunch box or a pocket for a little pick-me-up. Here is the first in a trio of quick and easy mini cards in a valentine theme using a new Jillibean Soup clear stamp set, kraft tags and Hampton Art mini cards. 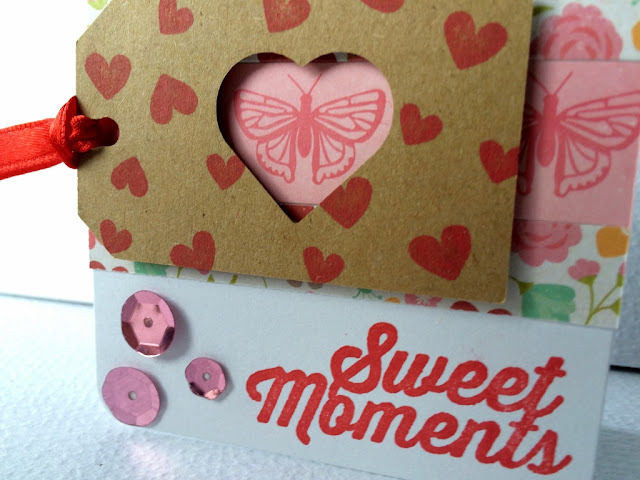 Beginning with the plain white mini card I stamped in red ink directly to the card front in bottom right corner the “Sweet Moments” sentiment. Next cut three border strips in the floral and butterfly paper as shown. Then using a different clear stamp set with mini hearts stamp in red ink the kraft tag with heart cut out. Last I added a red satin ribbon to tag hole and three pink sequins for a little bling. It is super easy and quick to create fun mini cards like this. Make a stash of mini valentine cards today!